Some people fantasize about the perfect lawn. They dream about push mowers, perk up at the smell of fresh-cut grass and tune into The Golf Channel just to see the landscaping. But perhaps you don’t live for yard work. Maybe you’re a new homeowner staring out the window at a front-yard jungle. The time has certainly come to mow the lawn. How exactly do you pull that off? Our love affair with a fresh-cut lawn is a relatively new development. For much of history, people remained preoccupied with avoiding starvation and plague. Foot traffic and grazing domestic animals kept the area cleared directly around a home, but the rest of the property was often used for gardening or left for wild plant life. In much of the world, this is still very much the case. But in the Western world, a well-kept yard has become the rave. The invention of the manual reel mower in 1830 made it possible for regular people to emulate the elegant grounds they saw surrounding palaces and mansions. Today, lawns in the United States alone cover a total of 25 million acres of land. A nice yard does far more than just add curb appeal. A healthy lawn helps prevent erosion and nutrient runoff while also filtering the air and producing oxygen. Regular mowings help stave off infectious parasites such as ticks and chiggers. These mowings also serve as the best possible weed control since thick grasses leave nowhere for weeds to encroach. When deciding how to go about mowing a lawn, it’s important to know about basic lawn care and exactly what kind of grass you have. Different grasses thrive at different cutting heights, and you’re going to want to adjust your lawn mower to accommodate your lawn. If left high enough, grasses will grow healthier root systems, and their own shading will help them preserve moisture. When in doubt, err on the side of cutting too high, and avoid trimming more than one-third the height of a blade of grass. Once you know how much to cut, the next question is how often to mow the lawn. If the lawn isn’t growing above its cut length due to drought or cold weather, then mowing isn’t necessary. Otherwise, lawn care experts recommend regular mowing. Weekly mowings are probably best if grass grows quickly due to abundant rain or if your mower struggles with higher grasses. Next, make sure you have the right equipment. Yard size is the main deciding factor in choosing your tools. If you have 8,000 square feet (about 743 square meters) or less, approximately 0.18 acres, then a manual reel mower may be the best choice. These simple, powerless mowers cut grass by rolling it through a spinning cylinder to a cutting bar. Electric, gas-powered and tractor-pulled variants are also available. Learn how a reel mower trims grass by reading How Reel Mowers Work. For larger lawns or high grasses, gas-powered rotary mowers may be the best option. These mowers use spinning, fan-like blades to tear off the tops of plants. These tools are available as both push mowers and riding lawn mowers. Gas mowers require more maintenance than reel mowers and contribute to air pollution, but they also boast additional benefits. High grasses and debris don’t slow these mowers, and many models boast a mulching feature. Grass clippings are full of nutrients and, if chopped into mulch, your yard can absorb them. Clumps left to sit on the yard’s surface, however, can smother grasses by shielding them from necessary sunlight. When it comes time to mow the trim, you may need additional tools and equipment. After all, you can’t do all the painting in your home with a paint roller, as tight corners and delicate areas require the use of smaller brushes. The same is true of lawn mowing. To trim the grass around structures or in delicate areas of the yard, you might have to use manual clippers or an electric weed trimmer. Weed eaters are available in both gas- and electric-powered models. 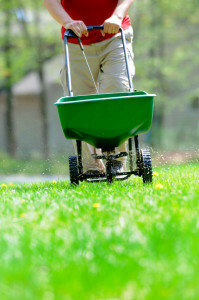 Most experts say the best way to mow your lawn is to avoid the day’s heat by doing it in the morning. In addition, avoid mowing after heavy rains, as this will make mowing more difficult and cause clippings and mulch to bunch. Mow in overlapping horizontal or vertical lines to get the most out of your mowing time, never in circles or spirals. Most experts also advise changing directions every couple of mowings. If you’ve mowed in horizontal lines for a few weeks, change it up and mow in a vertical pattern. This encourages a more natural lawn appearance. Alternating cutting lengths may be necessary to avoid scalping portions of uneven lawns. 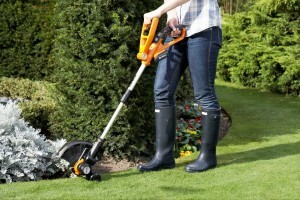 An effective mower is a well-maintained mower. Keep manual and gas-powered devices away from the elements to prevent rust and keep blades sharp. Gas-powered mowers require a bit more attention, however. Have the mower serviced and tuned up prior to the spring mower season. Mow across hills — never up and down. Freshly-cut grass can be slippery, but an added incline makes it easier to lose your footing and potentially mow over your own feet. Never pull a push mower, as this also adds to the risk of slipping under the blades. Wear protective eye wear when using rotary mowers and weed eaters. The spinning blades frequently fling small rocks and sticks, which can cause serious eye injury. They also stir up dust, which may necessitate the use of a face mask. Remove obstacles before mowing. Obstacles include water hoses, toys, tree branches and rocks. Avoid fixed objects in the yard such as sprinkler systems and water faucets. Confirm the mower is off before manually clearing the blockage. Keep children and animals out of the yard while mowing.